NPG is a white crystalline solid with a melting point of 127⁰C. This solid flake form has a tendency to fuse together and form a block, becoming difficult to separate, transfer, and handle. Molten NPG,transported at high temperature, ships in heated tank trucks. For molten NPG to arrive at the plant intact it is necessary for the heated storage tank to maintain a temperature at or above 140⁰C. A slurry / suspension form of NPG in water (90% NPG by weight) is a liquid at or above 38°C. This form of NPG ships in bulk at temperatures ranging from 50 – 70⁰C, enabling storage at a much lower temperature than molten NPG, at around 55 – 60⁰C. The flake form arrives in bags with the potential to agglomerate on storage. NPG has a combination of great properties but is rather complicated to handle; thus, we are continuously searching for a way to make handling easier. In contrast, we have found that MPO(2-methyl-1, 3-propanediol) has an equivalent resistance against UV light combined with humidity. Conventional wisdom previously held that the degradation process through oxidation occurred via UV-initiated radical chain propagation. Instead of a cleaving C-C bond, we have found that the liability of related C-H bond impacts the propagation rate and ultimately the rate of damage to a polymer film. A FMOC analysis indicated the C-H bond next to the ester links are the most vulnerable to oxidation attack. This theory offers only a minor difference between NPG and MPO in weatherability, confirmed by accelerated aging tests. 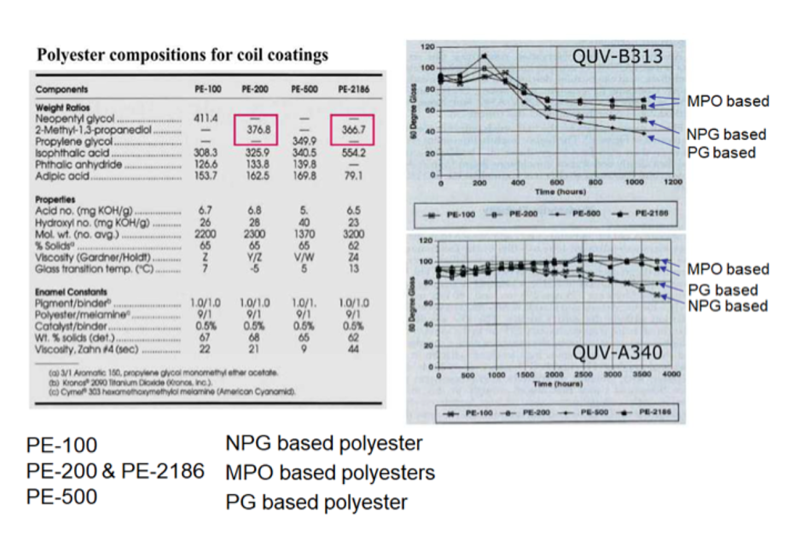 The below charts illustrate that NPG-based polyester formulation PE-100 is equal-to-less effective in gloss retention than MPO-based PE-200 and PE-2186 in a QUV-340 and QUV-B313 accelerated weathering test. This result confirmed MPO’s equally effectived weatherability in coating formulations. We can compensate for any possible differences in MPO by adjusting the hydrophobicity and glass transition temperature of the final coating. With this encouraging find, we looked into other properties of NPG. 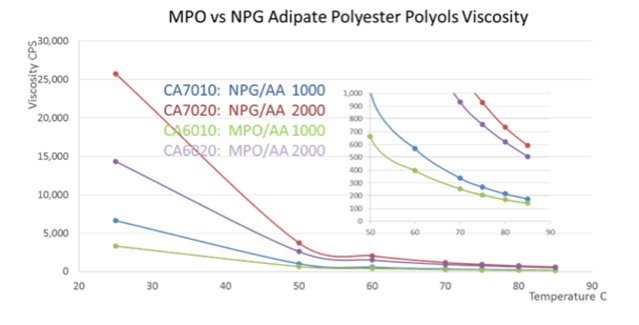 Another performance highlight of NPG-based polyester is its hydrolysis resistance. 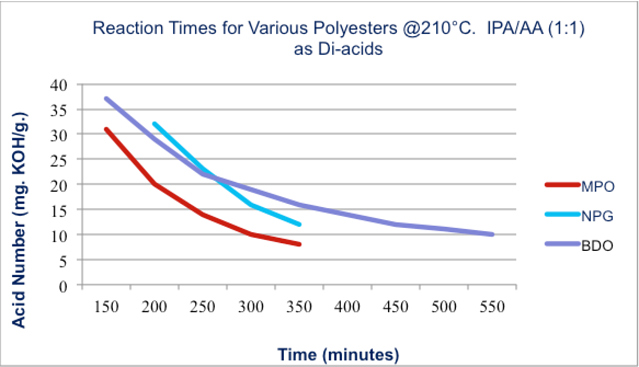 To make an apples-to-apples comparison, we synthesized polyester polyols using Adipic Acid to achieve a molecular weight 1000 polymerized diol. We mixed several such polyester polyols each with 10% weight of water and heated to 90⁰C separately. Also, we titrated acid value hourly to monitor the decomposition of each polyester polyol to form acid. 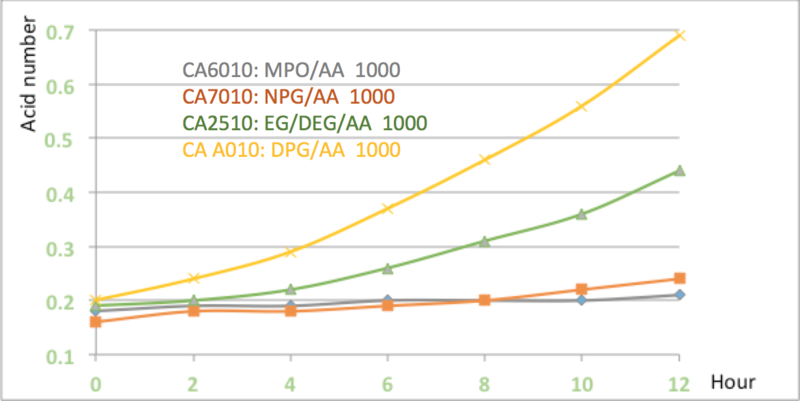 The test showed that NPG-based polyester polyol (orange line) is better for hydrolysis resistance than some polyester-diols but has similar or a little less hydrolytic stability than MPO-based (grey line) polyester-diol. A similar result should prove true when other di-acids are used to form the polyester, like Isophthalic Acid, Terephthalic Acid etc. The illustrated performance makes MPO appealing as an economical alternative for NPG, especially for coatings requiring a cold weather performance. This low Tg comes from the very low freezing temperature of MPO (-54⁰C). Low viscosity (178 cps) for ease of pouring and pumping. Fast reaction speed dueto its sterically less-hindered structure versus that of NPG. Low tendency to pick up moisture from the environment, for easier process control. The low melting point of the monomer MPO translates to a lower Tg of a MPO adipate. Ability to pump and pour at room temperature without expensive heated storage and transportation. All components will react into final product without extracting and disposal of extra water (from the NPG/water slurry/suspension). Built-in process aid to wash sublimed NPG off the reactor dome to improve efficiency. Lower reactor temperatures or shorter reaction times affording low color resins and reduced energy requirements. Good shock resistance at hot and cold temperatures. Good cracking resistance in can & coil coating. Good adhesion and flexibility in powder coating. With confirmed positive feedback in paints, coating and plasticizer applications, we are further investigating MPO’s feasibility in other NPG applications like lubricants, hydraulic oils, etc using its unique properties in low viscosity, oxidation and hydrolytic stability. For more information on MPO available at Gantrade, contact us today.